Gelatin capsules containing 10 mL of abamectin (a macrocyclic lactone in the avermectin family), an EPA-approved systemic insecticide for effective control of horn flies on beef cattle and non-lactating dairy cattle. Use exclusively with the VetGun™. 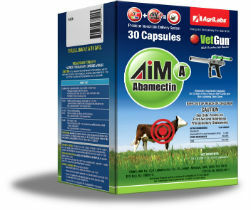 Each AiM-A capsule contains an abamectin formula (a macrocyclic lactone in the avermectin family), and is an EPA-registered insecticide for use on beef cattle and non-lactating dairy cattle. AiM-A VetCaps are designed to withstand transportation and handling, yet burst upon contact with the animal. Delivers a no-stress way to treat cattle when and where it's convenient. AiM-A (abamectin) VetCaps can be used in rotation with AiM-L VetCaps (lambda-cyhalothrin) as an effective in-season "rotation program" to combat horn flies resistance. It’s a perfect “one-two” punch to combat horn fly resistance. One cap treats 600-1200 pounds.